While it is certainly possible that you might find one of these in your pocket change, I suspect the chances are slim. The estimated mintage was less than 150,000 and they were discovered early, so many rolls were snatched up from banks immediately. Still, only a few thousand have been submitted to PCGS and only a few hundred to NGC, so there are many more of these somewhere. That's probably why prices have stayed relatively low (under $200 for MS64's like this). Note the "Strong" designation. There are examples with less sharp dates and rims; these sell for a little less (though they may be more rare - it's impossible to know right now). Although the chances of finding one now would be slim, it can't hurt to take a peek at your change, right? 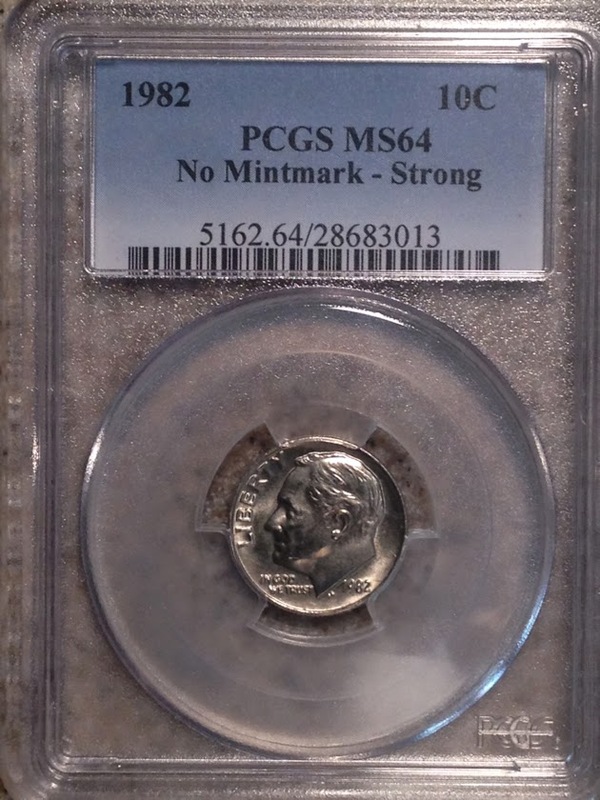 Note that no dimes prior to 1980 will have the P mintmark even though they were minted in Philadelphia. That 1982 no P...made me look thru a dozen or so of the ones I have...none of which were minus the P...I wasn't even aware they existed, and I've been a collector since 1956...yep a long time making me one of the older dudes...Thanks for displaying that coin! Yes, unlikely to find one - but why not look? I started around then also..